Unbalanced Load in Neutral Wire. Expected Temperature rise in Each Phase. Load in Each Phase and Outgoing Feeders. Size of Cables for Each Outgoing Feeder. The current calculations per phase for 3ph loads on this spreadsheet do not appear to be correct. E.g. 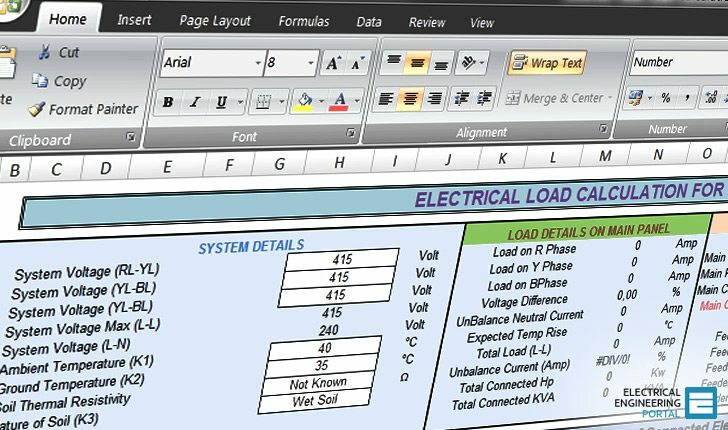 Input 5kW 3 phase load into spreadsheet. Current per phase should be 7A however the current per phase given at the top of the spreadsheet in Load Details section is 2A. Please review. Soof, The phase currents given under ‘Load Details on Main Panel’ and ‘Feeder Wise Electrical Load on Main Panel’ do not appear correct when using 3 phase loads. Again, with 5kW 3ph load, these sections show 2A per phase; by my reckoning this should be 7A per phase….or perhaps I’m missing something. How do I unlock the spreadsheet? want to connect..send me link to get registered.. I am having the same issue with the Panel spreadsheet. I get a webpage not available error. Edvard, keep up the good work. You have an amazing ability to make what seems to be very complex electrical engineering issues understandable even to a child. Great job! This calculation is not applicable for TW, THW THWN/THHN insulated cables and the number sets per phase. But it is very useful for BS standard cables. Note : I want lighting quantity spread sheet, if you have that sheet so please paste the link. Thanks Edvard. This very helpful…. 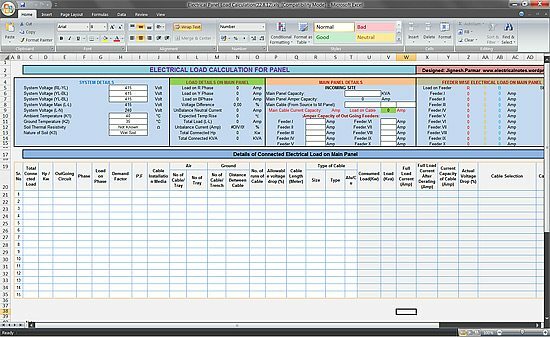 Please email me the software for Calculate Electrical Load of Panel , i don’t have the login. Dear Irsam, you must be registered member in order to download electrical software or books. Please email me a copy of that panel loading spreadsheet. It won’t allow me to download it. Just keeps asking me to login first. There was some problems on EEP with certain IP addresses when logged in. Try downloading now.